Confirmation by Ayupp.com – Aadhar linking to Voter id has already started. 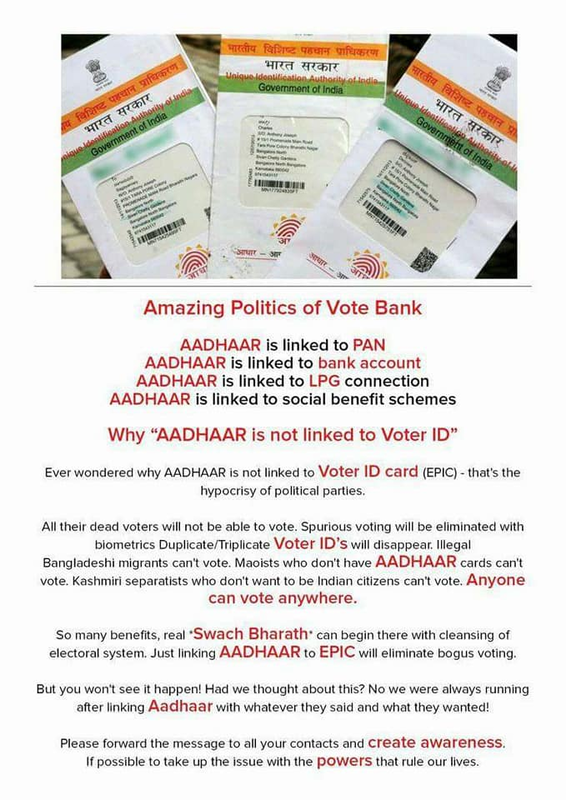 Ever wondered why AADHAAR is not linked to Voter id card (EPIC) - that's the hypocrisy of political parties. All their dead voters will not be able to vote. Duplicate/triplicate voter ids will disappear. Illegal Bangladeshi migrants can't vote. Maoists who don't have AADHAAR cards can't vote. So many benefits.... real *Swachh Bharat* can begin there with cleansing of electoral system. Just linking AADHAAR to EPIC will eliminate bogus voting. Ayupp Analysis – Social media is a platform where any news propagates like a jungle fire. A news has been spread from last couple of months, that why aadhar card is not linked to Voter id. Aadhar linkage with bank account, PAN, LPG and other social benefits scheme’s has been made mandatory. And there are some noble thinkers who have come to conclusion that our Prime Minister is Feku and he would never consider linking of aadhar and voter id. The reason behind that is bogus votes. Really? They think that it BJP gets duplicate/triplicate votes from same person. Not only India, even Bangladeshi people vote here for BJP only. The appeal is good, but intention is not. We came to know that linking of aadhar card has already started with voter id. Though it is not made mandatory till now. Step 3: Based on your data, the election commission will validate it against its database and if the record is found correctly, then it will be displayed as search result. Step 4: Now, you are required to “Feed aadhar no”. A links with this name will be created. Also, enable pop up blocker in your browser. Please note that Standard SMS charges will apply.